In Valladolid, a city of Spain, located in the northern part of the Meseta and in the Autonomous Community of Castile and León, about 700 meters (2,300 feet) above sea level, the climate is slightly continental, with moderately cold winters and hot, dry and sunny summers, though cool at night. 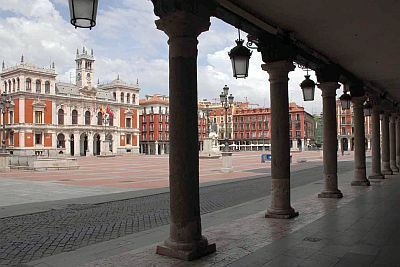 Compared to the climate of Madrid, that of Valladolid is similar, but slightly colder, especially at night and in winter, since it is located in a more northern position and at an altitude slightly higher. The rains are not abundant, since they amount to 465 millimeters (18.5 inches) per year, and in fact the landscape of the plateau is arid, especially during the summer months. The rains, however, are quite frequent from October to May, even though there's a decline in February and March. In May and more rarely in summer, some afternoon thunderstorms can burst, but generally in midsummer (July and August) it almost never rains. Winter, from December to February, is pretty cold: the average January temperature is 4 °C (39 °F). Rainfall, due to Atlantic low-pressure systems, is quite frequent, but generally not abundant. In December and January (and much more rarely in February), during anticyclonic periods, at night and in the early morning, fog can form, and it sometimes persists even during the day, keeping the temperature low (around freezing or a few degrees above even at midday). Every now and then, cold waves may occur, with snowfalls and frosts. The temperature drops below -5 °C (23 °F) quite rarely, however, this can happen during the most intense cold spells. In February 1983 and in January 1985, the temperature dropped to -11 °C (12 °F). Summer, from June to August, is warm and sunny; the average temperature in July is 22.5 °C (72.5 °F), but the difference between night and day is wide, so, while days can be hot, nights can be cool. There are quite often very hot days, as highs reach quite easily 34/35 °C (93/95 °F), with peaks of 38/40 °C (100/104 °F), even though the air is dry. However, at night the temperature remains relatively cool, hovering typically around 14/15 °C (57/59 °F), but sometimes it can drop to around 10 °C (50 °F) even in July and August. The transitional seasons, spring and autumn, are fairly mild (but at night it can get cold) and characterized by variable weather, with sunny periods alternating with the arrival of Atlantic depressions, which bring clouds and rains. In November, in good weather, fog can form. 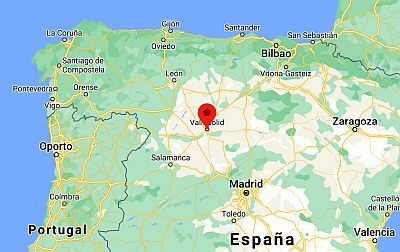 The amount of sunshine in Valladolid is great in summer, when clear skies prevail: in July there are on average 12 hours of sunshine per day. Sunny days are possible throughout the year, although in winter, also because of the fog, they decrease a lot: in December and January there are only 3 or 4 hours of sunshine per day. The best times to visit Valladolid are spring and autumn, especially in May, June and September. In June, however, it can already be hot during the day, especially in the second half of the month. In April, it can still be cold, especially in the first part of the month. September, too, is a good month, but at the beginning it can still be hot, while during the month the first rains can occur. In October, the air is often mild, however, the days get shorter, the rains are more frequent and it can start to get cold at night. Those who can stand the heat may choose July and August, keeping in mind that the days can be scorching. The temperature range between day and night is often high, so it is helpful to dress in layers and to bring something warm for the evening: even in midsummer, a sweatshirt can be useful for the evening, and maybe a light jacket too.